Have I Always Been A Prepper Homesteader? I have been a prepper homesteader for at least the last ten years and maybe longer. I have been wanting to be a homesteader for a lot longer than that. I would read and re-read the Little House on the Prairie books as a kid (and as an adult). I have always loved reading about early Iowa settlers and what they had to do to survive and thrive. I find their stories absolutely fascinating. As for being a prepper, I found myself becoming one out of necessity. When my son was born eleven years ago, we were broke. My then husband was unemployed and having a personal crisis. I was working part-time and selling everything I could to make extra money. We were getting by on the grace of our parents. We also had three little girls at home needing food and shelter. Sure we had a roof over our heads, but we really struggled to keep the power on. We also had a lot of credit card debt to pay off. After we got back on our feet, I swore that would never happen again. Not like that. He got a full-time job. I was eventually moved from part-time and full-time at my job. Then he decided he did not want to be married to me anymore. I filed for divorce and did the best I could to get by. My parents and his parents helped when I asked for it. Even though I had a full-time job, I worked a couple small part-time jobs. I still had to apply for food assistance, child care assistance, and Medicaid. I didn't want to, but my kids were not going to go hungry. Child support was still getting straightened out and took a few years to be consistent. When I got food assistance, they gave me more money than I had ever spent on groceries. Even when things were going well for us, I never spent $450 a month in groceries. I used the extra money to start my food storage. I never again wanted to look in the almost bare cabinets and wonder how creative I could get to feed my kids. I was already making almost everything from scratch so I found it easy to know what to stock up on. I had a top ten list of things to stock up on when I went to the store or found a good deal. When I found myself having an adequate stock of those things, I made another list of things to stock up on. I also started using my tax refund to buy meat in bulk. I would buy a half of a beef or pork for the freezer. The price was so much lower doing it this way! The first stage of my prepping journey was food storage and the second stage involved becoming a lot more frugal. I barely ate out unless I was invited to do so. I shopped a lot more in the thrift stores. I started learning how and doing my own repairs. I mended a lot of the kids' clothing. We already shopped garage sales for their clothes. I drove vehicles until the wheels fell off. I tried not to buy anything unless it was a necessity. I found ways to lower our bills or eliminate them altogether. The third stage was learning more about gardening and do more canning. I had always dabbled in gardening and had some success. I started to get more serious about gardening and canning everything I could. I am still learning about gardening and from the mistakes I have made, but I have accomplished learning about canning. I have also learned a lot about dehydrating and freezing produce. During this time, I got off food assistance and Medicaid. We didn't need child care assistance anymore when my son went to school. It was a good day when this all happened! Some days I wish I had the Medicaid back, but I also enjoy not having the government all up in my business. Their questions can be rather intrusive. I added laying chickens to the homestead. I raised them from two day old babies and now they are 1.5 years old. I have twelve chickens and get 6-8 eggs a day. I wanted to be able to produce some of my own food in addition to gardening and this was a good start. I hope to add meat chickens this year and learn about butchering. In the meantime, I have been learning more skills and reacquainting myself with others like sewing. I have a good supply of essentials in case of emergency and natural disasters. I keep my vehicle stocked just in case we get stranded or need to make a repair. I keep things on hand like camp stoves, propane heaters, and whatnot just in case we are without power for any length of time. I am always filling jugs for water or accruing more drinking water from the store. I would love to get a 55 gallon drum for water, but I haven't done so yet. Hopefully in the next few months I will be able to get one. I also want to get a water filtration system like a Berkey so we can have clean water for drinking and cooking. I am also working more on getting prepared for pets. I buy extra every month and, little by little, get a better stockpile every month. The dog has thrown me for a loop by eating more again so I need to adjust that. However, we just keep the dry pet food in sealable buckets to keep it fresher and free of mice. 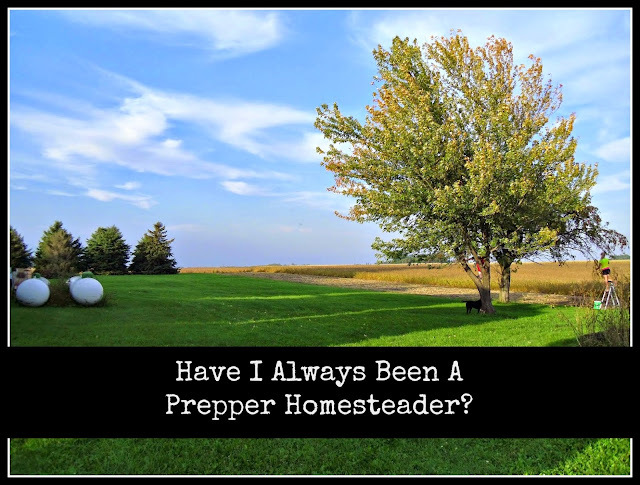 Becoming a prepper homesteader takes time. I still working at it every day and learning more as I go. I know I need to do more. I am very proud of myself for how far I have come. I read books, blogs, and watch videos. I research a lot before I start a project. I practice the skills however and whenever I can. I am not an expert by any scope of the imagination, but I enjoy sharing what I have learned. You can become a prepper homesteader too. Your journey to it might look a little different than mine and that is more than okay. All that matters is that you go on this journey and become one!